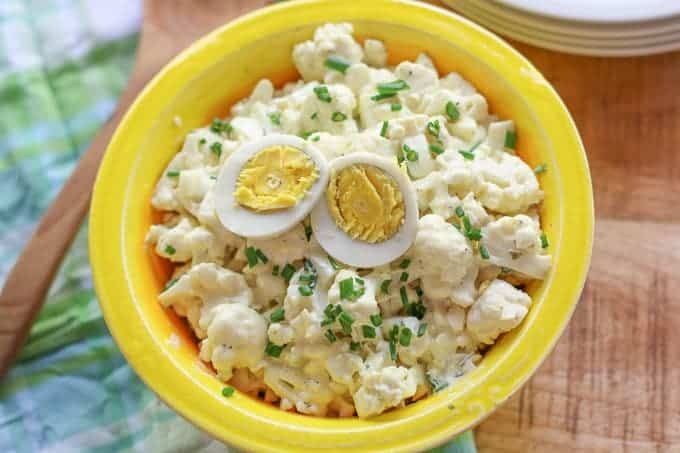 If you love potato salad, then you will love this low carb Southern Cauliflower Potato Salad. It has all your favorite flavors as the traditional version with a little added crunch. I go weak in the knees over a good potato salad. When I have a cook out, I almost ALWAYS include my Bacon Ranch Potato Salad. I only make it when I have friends coming over because it is a possibility if left alone, I could eat the whole bowl myself… However, day to day, I can’t eat that many calories and carbs. I was craving some potato salad when I decided to make this Southern Cauliflower Potato Salad version. Ya’ll I can’t tell you how much this salad truly tastes like the original Southern Potato salad… It is freakin’ AWESOME!!! And guess what?!? It is ridiculously low in carbs! Raw cauliflower has very little flavor. It just takes on the dressing you slather it in. Therefore, when you mix it in my potato salad dressing mix, it tastes just like the real stuff. One little hang up… very minor… it has a little crunch. For texture people, this might be a problem. However, my husband has major issues with food textures and it didn’t bother him at all. For me, I kind of liked the crunch. Who knew? I am not on a low carb diet. I gave up that train years ago. But I do watch my carbs. I try to keep it all balanced. There is nothing wrong with splurging occasionally on some wicked good potato salad. But let me tell you; this Cauliflower Potato Salad is wicked good itself. I would make it whether I am watching carbs or not. But let me give you the skinny on this low carb potato salad. One cup of boiled potatoes are about 166 calories and 31 carbs while 1 cup of raw cauliflower are 25 calories and 5 carbs… That is a big difference. 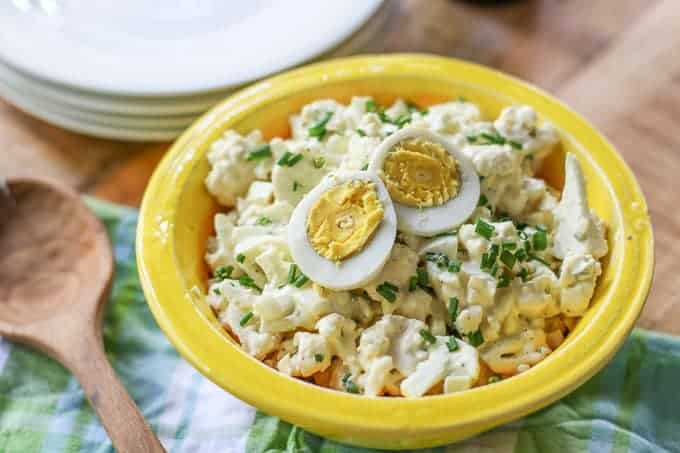 Honestly, whether you are on a low carb diet, or just wanting to try something new, MAKE THIS CAULIFLOWER POTATO SALAD! It is absolutely delicious. You won’t be disappointed. Enjoy! If you like this recipe, check out: BLT Deviled Eggs, Summer Corn Salad, Seven Layered Salad. 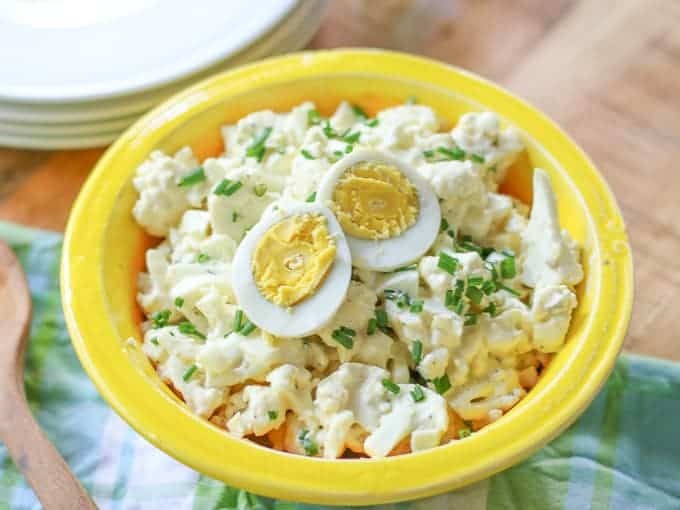 If you love potato salad, then you will love this Southern Cauliflower Potato Salad. It has all your favorite flavors as the traditional version with a little added crunch. In a small mixing bowl, mix mayonnaise, mustard, dill pickle relish, and celery salt. Add dressing mix to cauliflower and stir until all of the cauliflower pieces are equally covered. Chop boiled eggs. 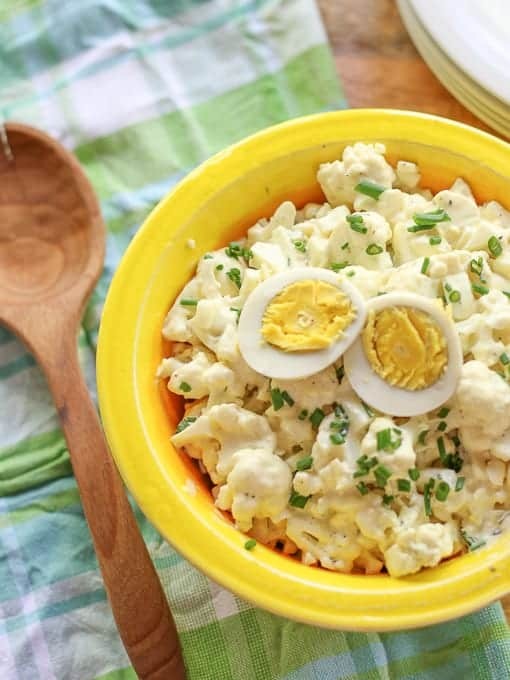 Mix in eggs to cauliflower potato salad. Salt and pepper to taste. You can serve immediately, but it is best to cover and refrigerate an hour before serving to allow the flavors to fully build. Love that you use cauliflower and super creative! Great low carb recipe to a classic favorite .. perfect for summer! I’m slightly obsessed with cauliflower and have been all my life. This recipe is happening ASAP! I am a big low carb recipe fan!! This looks amazing and perfect for the Australian spring/summer coming up. I’m a sucker for a good potato salad, too, especially one with bacon! I love that you’ve created a low carb alternative! What a great idea for a healthier potato salad! I need to do more with cauliflower. Yum, we love making cauliflower potato salad at our house. The fact that yours includes onion and relish totally makes this unique though. I’d love to try your version! Love a good potato salad. Your recipe looks amazing with addition of cauliflower. Pinned ! Loving this low carb alternative! I am like you and go bananas over traditional potato salad, but all those carbs can take a toll on you. Yum! Love that you have used cauliflower as a main ingredient in this salad, puts a nice spin on a classic!